IOLAN SDS1 TA4D2 Secure Ethernet I/O Device Server - four analog inpputs and 2 digital I/O, 1 x DB9M connector, software selectable EIA-232/422/485 interface, 10/100 Ethernet advanced data encryption, user authentIcation and event management security features included, IPv6,COM port redirector, 15kv ESD. Terminal block connectors for power and I/O. Extended Temperature. Perles Ethernet I/O technology enables comprehensive access and control of remote digital I/O, analog I/O, pulse I/O, relays and temperature sensors on any IP network. 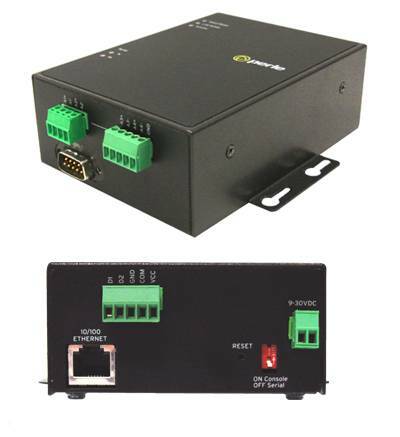 For complete product details and technical specifications, please visit our Secure Ethernet I/O Device Server Product Page.